How Do You Make Reading More Fun?! My teacher says that I should read more so that I can do better in school. But whenever I start a new book besides Dork Diaries, it’s like I never finish because reading is SOOOO BOOORRRIIING. Any advice for how to make reading more fun?! It’s one thing for your teacher to make you read a book you don’t really like. But, whenever YOU have the freedom to pick the book, it should be enjoyable and it shouldn’t be something that you have to think too hard about. I’m sure that lots of books have some boring parts, but great books have stuff that keep you interested (like Dork Diaries 🙂 )! So, my best advice is to try finding a book that’s about stuff you’re into. It’s an awesome way to make reading more fun. Because if there’s no interest, then it’s like you’re forcing yourself to read the book. And anytime anything is forced, odds are that you just won’t enjoy it. So, for example, if you really like skateboarding, try finding some books on skateboarding. Because you’re already interested in the subject, the reading should be a lot easier to get through. Plus, I’m sure that you’ll find out a bunch of cool facts! Or, if you don’t want a book containing lots of facts, find a story that sounds interesting. Like if you’re into wizards and magic, read JK Rowling’s Harry Potter. If you’re into fairytales with a wacky twist, read Whatever After, by Sarah Mlynowski. Maybe you like books about interesting people or celebrities. From Martin Luther King Jr. to Taylor Swift, I’m sure that there are a bunch of books out there just waiting to be found! For some of us, pictures actually make the book more amusing, especially if you’re an artist like my friend, Nikki Maxwell, or into comic books like my friend, Max Crumbly. If that describes you, I highly recommend graphic novels like Smile, The Babysitters Club, Invisible Emmie, Baby Mouse: Tales From The Locker, HiLo, and Dog Man. Hey, in my opinion, you’re NEVER too old for a book with pictures in it. And lastly, although it’s somewhat unusual, you should definitely judge a book by its cover! I know, I know. The old saying is to NEVER do that. But you CAN actually learn a lot about what the book will be about just by looking at its cover. What the book shows on its cover should grab your attention. Then try reading the first page and skip around a bit. If it seems interesting, it’s a perfect fit! If not, put it down and find something else. Sometimes finding the perfect book on your own can be tough. So, try asking your parents or a librarian. Just tell them what your interests are, and I’m sure they’ll be able to help you. Hang in there, and I just know you’ll find something. What about you guys? What types of books do you like reading? 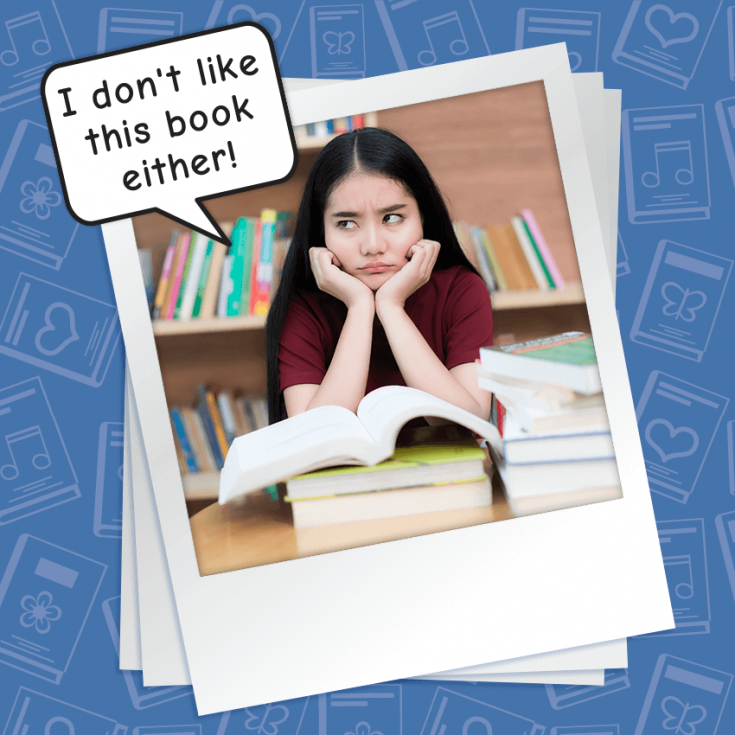 Do you have any advice for Bothered By Boring Books? I say you should try I few books. Use your everyday interests and stuff to find out which books you like. If you like watching movies/TV Shows that relate to, let’s just say, adventure, you should try look for books that are somewhat in that genre. Or, you should read the ones that are extremely suggested and preferred . Like Percy Jackson, Harry Potter, Kane Chronicles, Diary Of the Wimpy Kid, Roald Dahl’s books etc. What sort of movies do you watch? Matching the genre of the movie to a book can be fantastic for finding your genre. For example, I like action, adventure,sci-fi, and fantasy. Some of my favorite book series (besides this one) are Artemis Fowl by Eion Colfer, Harry Potter by J.K. Rowling, Percy Jackson by Rick Riodan, Michael Vey by Richard Paul Evans, and loads more. Maybe you like sob stories with animals. Try Where the Red Fern Grows (Wilson Rawls) or Call of the Wild (Jack London). I promise there’s lots of fun times waiting ahead once you find your genre! I read Matilda before and it was really good. if you want advice, ask me! I hate reading! It’s not always fun and indristing. But reading Dork Diaries.I hate nonfiction books,there boring. Percy Jackosn all the way!